Jackie L. Kitterman, 87 passed away Tuesday, April 9, 2019 at Baptist Health Floyd in New Albany, IN. He was born March 30, 1932 the son of Alva and Roberta Catherine Wiseman Kitterman. He was a 1950 graduate of Silver Creek High School. 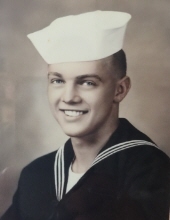 He was a Korean War Veteran serving with the U S Navy. Jack worked as a Telecommunications worker installing telephone office equipment across the southeastern United States for 32 years beginning with Western Electric, later AT&T and lastly Lucent Technologies before retiring in 1992. He is survived by his wife, Dorothy Wilson Kitterman of Corydon, IN; two sons, Steven B. Kitterman and David Kitterman (Barb) both of Corydon; daughter, Patricia Terry (Sam) of Munfordville, KY; brother, Paul N. Kitterman of North Carolina; two sisters, Carolyn K. Rogers (John) of Jeffersonville, IN and Roberta Ann Broadus (Ronnie) of Laconia, IN; four grandchildren, Devin Kitterman (Mary) of Carmel, IN, Zachary Kitterman, Chris Duley (Tara) and Jessica Adamson all of Corydon; five great grandchildren, Mayson and Jackie Sullivan Duley, Kelsi and Trenton Adamson and Dakota Jenkins. Funeral services will be held at 10 AM Tuesday, April 16, 2019 at Gehlbach & Royse Funeral Home in Corydon, Indiana. Pastor Steve McAfee will officiate. Burial will be in Perseverance Chapel Cemetery near Corydon. Visitation will be from 1 PM to 8 PM Monday, April 15, 2019 and from 9 AM to 10 AM on Tuesday at the funeral home. In lieu of flowers the family suggests memorial gifts be made to the Perseverance Chapel Cemetery Fund. To send flowers or a remembrance gift to the family of Jackie Lee Kitterman, please visit our Tribute Store. "Email Address" would like to share the life celebration of Jackie Lee Kitterman. Click on the "link" to go to share a favorite memory or leave a condolence message for the family.